Sound starts at the string. What the string can produce the amplifier and speaker can reproduce. The opposite is equally true. The formula for the set of strings contained in this box is simplicity and purity.ﾠ Each string is wound on a high carbon steel round cores, so that pure nickel wire can be wrapped completely in contact, and tight around it. The use of round cores also provides extra flexibility as compared to hex coresﾅthus it is more sensitive to touch. Each string has only one layer of wrap wire allowing it to vibrate freely, and provide a beautiful tone that can bite when you dig in. The tonal characteristic of these strings is open and clear with shimmering overtone spectrum adding to percussive detail. On regular bass strings the overtone is slightly stronger than the fundamental. That makes the note sound an octave higher thanit really is. 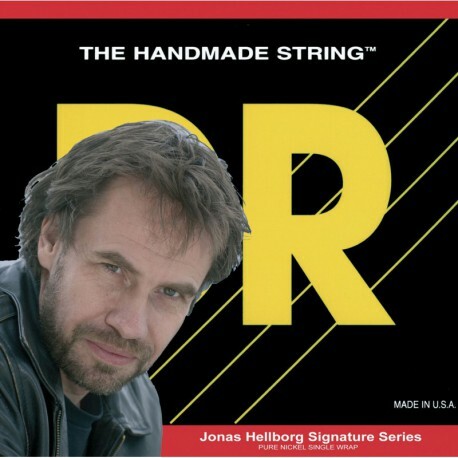 On these uniquely designed and constructed strings the fundamental is cleaner, deeper and louder - comparable to the strings of a grand piano. The tone and expressiveness of the Jonas Hellborg Signature strings has no match. Welcome to a brand new start in bass guitar sound, from the bottom up.